OUR PRICE: $61.20 - Join Rewards Get $6 Dance Dollars On This Item! Bloch's mesh dance sneaker with DRT (Dynamic Resistance Technology) features a dancer-specific, high arch last for true fit and comfort. Made of genuine suede and lightweight breathable mesh, with a Dri-Lex heel and tongue. Suggested Fitting: Women order 1-1.5 sizes larger than street size. Men order 3 sizes larger than street size. My daughter typically wears a size 6 to 6.5 depending on the shoe. Finally, after 2 returns because they were too small, we have settled with a Size 8. I'm disappointed as I was replacing this shoe after years of happy ownership and wearing its' prior German made version. I used to recommend it to everyone.The new one feels cheap and much less well made by comparison. This is my second pair of Bloch dance sneakers - I wear them 5-6 days per week; I dance on anything from wood floors, concrete, tile to carpet and they protect my feet and legs and keep my comfortable all day. I prefer these over the capezio because they have a slight heel which is better for the type of dancing I do - I also think they last a little bit longer. Lastly, it is SO fun to have a pink pair of dance shoes! I also have them in black, but pink is a really nice, fun change of pace. I am not sure how to address this shoe. The first pair differed in the arch support, so it was returned. I believe they sent me same pair, because it fit the same way. The right shoe had a higher arch than the left shoe. I am returning that pair. I was so looking to Zumba all night! I did a lot of research for a good Zumba/dance shoe and this one got a lot of great ones, so I had to try it out. I absolutely love this shoe and would recommend it to anyone. I love it so much that I will be ordering the black one as well. Only thing to remember when purchasing is this shoe does run small. My feet are wider, so I bought this two sizes bigger than what I normally wear and it fits perfectly. Hope this review helps! I purchased this exact shoe 3 1/2 years ago and have been dancing in them at least for 3 hours every week. The fit is perfect and they are extremely comfortable. I am now ordering a new pair for myself. I ordered two sizes larger and the shoe fits perfect. The first time us did Zumba in them my arch of my foot hurt, and my knee started hurting. I like and will keep using, I think they just need broken in and getting used to. 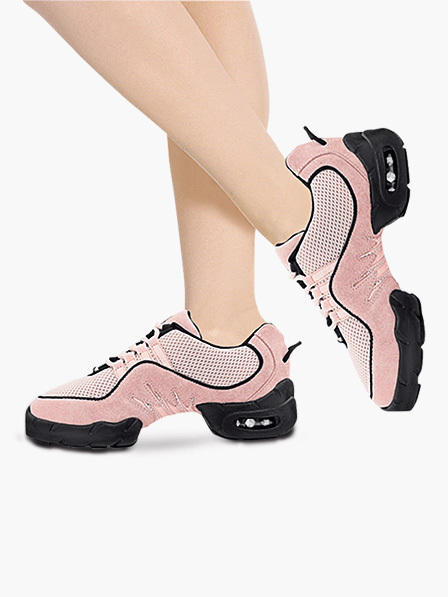 I purchased these sneakers specifically for Zumba, in pink. The color is not ballet pink but a pretty pink you have to be wanting to wear this color. My foot is a size 7.5 - I bought a size 9, perfect. If you have knee problems, the base of this sneaker will extremely help out alot. Especially with all the pounding. People in the class have asked me where I purchased these and they all bought them in Black! I am back to buy them in Black... I do not wear these outside at all, because of the sole that allows you to spin and the dirt would mess up the bottom. You will love these! I love these shoes. I wear them for Salsa, very comfortable. I wish they sold them in Powder Blue again. Buy at least a size or two than your regular shoe size. I purchased 3 pairs in JULY 2004; black, red & blue. All were wonderful, comfortable and served the purpose for my tired dancing feet. I have now had another bunion procedure & will be ordering all new bloch sneaks. As you see from the purchase date, the bottoms actually fell off all three of the old pairs, and I got my money's worth. I bought these shoes about 3 years ago in every color I could get my hands on. They do run small. I wear an 8.5 to 9 in street shoes and have to get these in a size 11 (I can get a 10.5 on but it's really snug through the toe-box). When I bought them, they came with two different types of laces - (1) thin black elastic and (2) thick traditional sneaker laces to compliment the color of the fabric. I like the look of the traditional laces but have found the elastic laces are better at pulling the arch of the shoe up which makes them more comfortable (supportive) to wear for a long period of time. I've seen some people use both sets of laces. I like the way I can just slip them off and on without having to undo the laces. I ordered several pairs of pink color ones for me and my friends. The color is more like beige than pink, far from what it looks like in the picture. The worse part is one of them has darker shade to it which makes it look like a worn-out one. They could have done a better Q.C. Great for any type of dance! I've bought up to 3 pairs of these and love them. I do Latin Ballroom dance, and these really help me practice during times when my feet are tired from my heels and I need to regain connection with the floor. I've worn these to social dancing, competitions (anytime that I'm not on the competition floor) and on the street. I prefer them over regular sneakers sometimes! The only flaw that I've encountered with these are that the plastic part in the front for spinning on pointe starts to peel off from the fabric after a year or so. But then again, we drag our toes on the floor in Latin so maybe this does not present as a problem for other types of dancing. Overall, I've known both men and women who wear these for ballroom and love them. I really recommend them! I wear these shoes for Zumba and Line Dancing. They are GREAT, I love them but they run small. I wear a 7 in a street shoe and 7.5 in athletic shoe. I had to get a size 9. I ordered the 8 but they were way too small. I've ordered two pairs in pink and a blue, but I was very disappointed when they were so small, I've returned them, so I can get a size larger. I can't hardly wait to start using them. Maybe it's just me ? I bought these shoes a few years back and I always found them extremely uncomfortable. It fits well, though -- I generally am a size 5, and the size 6 was a perfect fit. Great shoes for zumba. I received it yesterday and absolutely love it. I ordered size 8.5 and my regular shoe size is 7. They fit but little smaller. So when you are buying, take their size suggestion seriously. I just received my first pair of these! They fit as advertised, which is, in my opinion, a real issue, especially when ordering on line. I am especially pleased with the quality as well. How they will wear for me I don't know, as I tend to be rather hard on my shoes in general. I'm wearing them now and don't want to take them off. I guess I'll have to sometime. I'm a lyrical/jazz/hip hop dancer, and these shoes are perfect for the latter two. Amazing color--I get so many compliments! Very comfortable despite the fact that I bought them in a size too small! Make SURE to buy these in A SIZE LARGER! Other than that, they're perfect! I love how my foot looks when I point in them, and turning is a breeze in these. I recommend two things: buy them 1 SIZE LARGER, and buy them on this site because they're expensive as heck in stores! Fits wider metatarsal and narrow heel! Enhances arch and allows full articulation of foot. Supportive construction/design without foot feeling constricted during movement. Fits wider metatarsal feet with narrower heel. Same shoe, but now in other colors too? I bought these in black before they were offered in other colors, and I'm certain it's the same shoe. I LOVE them! I'm entering my 5th year with the same pair of sneakers and I have no holes or tears (though some friends got a hole where the big toe hits on the top- and I think it was because their shoes were a little too small). I love the way they look from afar. 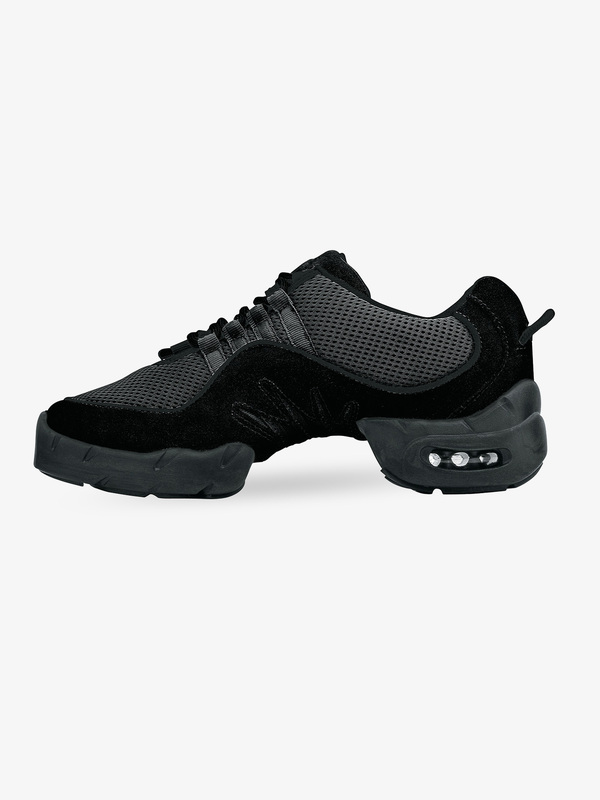 I was a team member on, and later coached, a high school Dance Team, and these shoes are great for high school performances; both indoor and outdoor. A fantastic all-purpose shoe! It is harder to show off your pointed toes-especially if you're a beginner with new shoes- but it is a sneaker, so if elegant pointed toes is what you're looking for, you probably won't be looking at this shoe. Depending on your foot shape, they can be hard on the arches at first- but in my experience, I only heard that complaint in the beginning, before they were broken in. My street shoe is size 10W, and I wear an 11.5 in these shoes. And, like I said, they're fantastic all-purpose shoes and they really do look good from an audience point of view. Runs very very very very small! I live in Japan. My salsa friends and I ordered these shoes. I ordered two full sizes up than my regular street shoe and was able to fit into it. I like these shoes enough. The back is really cute too (^_^) But none of my other friends could fit into them. They were really, really small. So be sure to order way bigger than you think you need. The shoe is really, really cute and easy enough to dance in. It came with both black and pink laces, which gives it a different look. It doesn't make sense to send back the shoes with international shipping rates and all, but because they are so cute, we quickly found some other girls with smaller feet to buy the shoes off of us and we are re-ordering. So, all of Japan will be wearing pink shoes soon . . . who knows. Hopefully, we get the right size this time. They are really comfortable and last for ever. I have had mine for 4 years with no trouble. I bought these in pink for an accessory. Immediately put a hole in the bottom of the suede. Am now to afraid to wear them for tearing it further. Also had issues with the sizing being off slightly. I love these shoes! I would get them in a fun color like pink or blue, but I couldn't wear them in performances then. They last forever, and could be sold after you grow out of them, because they wear so well! It's a great shoe; my mom, my sister and I got a pair. They are really nice and a great value. The only thing I had a problem with, was it was kind of hard to balance because the bottom of the shoe is so thick. But other than that, it's a good shoe. I bought these shoes in the pink and they are super cute! While I usually wear a size 7 I bought a size 6 and they are fitting fine, so I'm not sure if I would follow the fitting directions. do these dance sneakers have a spin spot. I would like to wear them for zumba. Most of our sneakers, like this one, do have a spin spot. Should I buy a size or 2 larger than my regular size? According to the reviews, people buy 1 or 2 sizes larger. I have a pair of these but a 6.5 when I wear a 7. They are a little tight & had my big toes black by little fungus, but had them for 6 months & feel great except the tightness. What would you recommend, just my regular size 7? For regular sizing the manufacturer recommends going up 1-1.5 sizes from regular street shoe. If you already have a pair of these and are looking for just a little room, I might suggest just going up a 1/2 size. For each 1/2 size you will get an addition 1/4 inch of room. Unfortunately we cannot guarantee sizing.